On September 26, 2013, a Navy transport ship being towed by tugboats slammed into the superstructure of Mathews Bridge, a steel bridge that spans 7,736 feet across the St. Johns River in Jacksonville, Florida. The impact severed a main truss member, one of the bottom beams that support the triangle shape (a truss) of the bridge. Although the bridge did not collapse from losing this primary beam, it was immediately closed to traffic based on safety concerns. RS&H was called to the scene by the Florida Department of Transportation (FDOT) to serve as the prime design consultant for the repairs with the goal of quickly reopening the bridge for travelers. We quickly mobilized a project team, signed and sealed construction drawings for repair, assisted with inspections, helped plan and execute the installation and monitoring of strain gauges, coordinated all subconsultants, and communicated with the FDOT throughout the project. Project Manager Bryan Sturm and other RS&H associates were on site daily to assist with the project and to help address issues as they arose. The first few hours after the collision were critical in establishing the foundation for the successful project. In 24 hours, the project team had to go from impact to plan. In the next 24 hours, RS&H had to develop and articulate a plan for its five contractors and then – within a day – provide fully detailed drawings, signed and sealed, to construction crews. We also prepared exhibit boards to help keep the FDOT and public informed about repairs, as well as provided input on most aspects of the project, including load testing. The urgent schedule was one of the most challenging aspects of reopening the bridge. The team had to review steel fabricator drawings in 12 hours – a process that normally takes 30 days. But, since we completed previous work on the bridge and were familiar with its structure, RS&H was uniquely qualified to provide an expedited solution and solidify plans quickly. Our relationship with FDOT meant a repair team was essentially already assembled. Subconsultants with experience on the bridge were invaluable as plans were quickly prepared and repair work began. RS&H was able to capture and visualize the effects of the collision by using a full three-dimensional model of the bridge, which was developed previously and used extensively in the Mathews Bridge deck replacement project in 2007. The deck was replaced with a rigid, lightweight Exodermic deck, which may have helped stabilize the bridge after it was hit by the Navy transport ship, preventing a catastrophic failure. Leveraging the expertise of its construction team, RS&H and its subconsultants developed a bold method to restore geometry to the bridge, using stressed post-tensioning bar and leveraged steel strongbacks to perform temporary repairs that enabled final restoration of the bridge. In order to replace the severed member, our team faced several unique challenges. First, the connection points for attaching the replacement chord were badly deformed from the force of the impact. 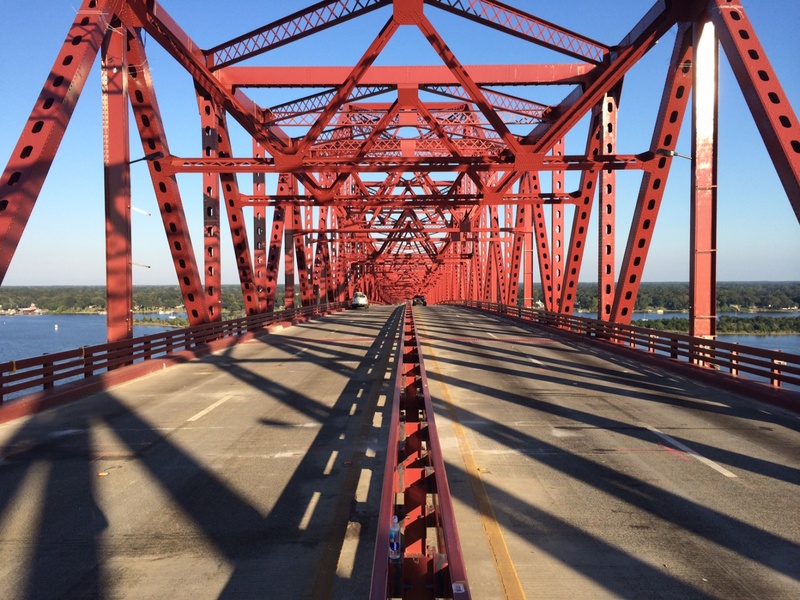 A method known as heat-straightening was used to restore these points and was greatly preferred to fully taking apart this complex, multi-member truss connection. In addition, a shorter and lighter stub beam was installed at the impact connection point, greatly simplifying the management of this complex connection with hundreds of bolts. Deflections and forces were monitored with more than 100 strain gauges, allowing engineers to ensure that tension was being properly and safely restored into the new member. The gauges allowed the team to dynamically see the stresses on the bridge in real time. These techniques sped repairs and allowed the bridge to be opened to traffic after only 33 days, a full week before the already aggressive deadline. The project was a perfect example of cooperation and well-coordinated teamwork. The team went from impact to scope document to signed and sealed drawings to discussions with five contractors in a 76-hour period. The bridge was repaired in less than 40 days even though some contractor estimates had called for repair efforts lasting months. Because of our previous experience on the bridge, the already developed bridge model with automated post-processing, and significant specialized expertise, RS&H’s team was fully prepared to immediately address demands and effectively oversee a critical repair operation.